Homer Simpson, your Elysian Fields await, and they're covered with sprinkles. 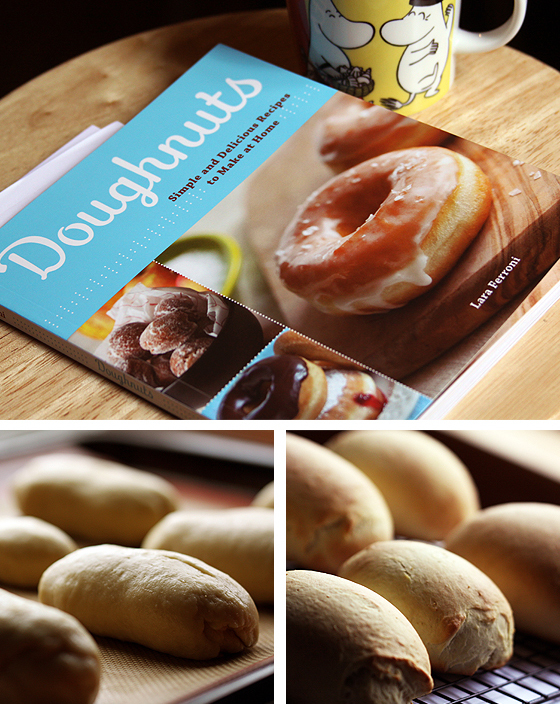 Lara Ferroni's new cookbook, simply and sweetly titled, Doughnuts , pretty much says it all. OK, so the full title is Doughnuts: Simple and Delicious Recipes to Make at Home, but really now, be honest, she had you at "Doughnuts," right? I had the wonderful opportunity to get a look at Lara Ferroni's mouth-watering and beautifully photographed book about everyone's favorite breakfast treat. Going through the book, it's a collection of luscious imagery that stir up sugar-spun memories of childhood. Seeing the stacks of colorful glazed beauties made me think back to the mornings when my mom would take me with her on her grocery run to the Lucky's Market, and we'd stop off at the Winchell's doughnut place nearby. The twisty shapes and chocolate-covered delights were tempting, but I'd always get the same glazed doughnut bedecked and bedazzled with bright hues of pink, orange and green sprinkles. She'd ask if I wanted something else, offer up something new for my sugar-addled palate to try, but I'd never falter from that sprinkled choice. I have very vivid memories of those seemingly humdrum grocery store mornings, made all the more special and bright with a little pastry treat before going home. When I think of glazed doughnuts, I think of simple pleasures, and a lovingly indulgent Mom. Fast forward many years and a wider selection of doughnut appreciation under my rapidly tightening belt, I was eager to try out a recipe in Lara Ferroni's book, to share with visiting friends. 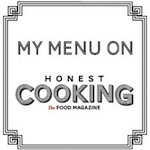 Doughnuts are traditionally a fried pastry, giving it that light, buttery crispness that we've all come to love, and I was pleased to see there were a couple of baked doughnut recipes in the book. It's also a gluten-free-friendly book, offering recipes that use alternatives to wheat flour. The doughnut dough itself is fairly basic, with just a few variations, and it's more about the ways one dresses it up with toppings and glazes. Just consider the doughnut the Little Black Dress in breakfast pastry-land, where accessories can change the look of it for any occasion. S'more Doughnut? Yes, please. I went with the baked doughnut recipe, which was basically a sweet yeast dough that rises to the occasion. I know, it's best enjoyed fried, but I didn't want to be fussing with hot oil that early in the morning, before the coffee had fully kicked in. The baked doughnut not as light as its fried counterparts, with the recipe accurately describing the finished texture as a bit like a bagel. But it's not so sturdy that you want to smother it in cream cheese -- once baked, it remains tender and best enjoyed still-warm. I don't have a doughnut cutter, so I tried my hand at making DIY maple bars, as the book has a recipe for a maple glaze. Unlike the store-bought maple bars, the finished glaze isn't a food-coloring caramel, but a more natural, opaque ivory that hardens to a nice sweet shell over the finished doughnuts. Clearly, my maple bars were more like maple buns. I didn't want to over-handle the dough by forcing it into a long bar shape, so I just made little loafy-looking things. 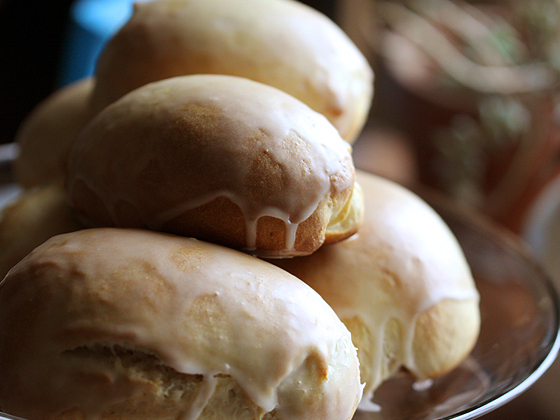 They rose up and baked into puffy zeppelins and once glazed they looked a bit like frosted loaves of bread. I don't care. They were delicious and with fresh brewed cups of coffee, my friends and I enjoyed every bit of their maple bar/bun goodness. I think i would still probably slather them in cream cheese, or maybe just butter, but i would make sure it was nice and soft first. People should pay you to review their stuff- you do it justice more than any blogger I know. This is ultimately a very nice and delicious treat for me. I wish I can make some today. Denise, these look amazing. How much time did you invest in making these? I'm sure they worth it! Yum! Delish. This looks incredible. i definitely have to investigate this book! Isn't it an amazing book! I love the Homer Simpson reference ... <>.